Most LGBTQ centers rely on volunteers: 25 percent have no paid staff, and 32 percent have less than five paid staff members. LGBTQ community centers across the U.S. serve more than 40,000 clients a week, but many have no physical space or paid staff, according to a report released this week. Naomi Goldberg, policy and research director at Movement Advancement Project (MAP), a group that researches LGBTQ issues, is a lead author of the study. She told NBC News the report highlights the range of conditions LGBTQ centers operate under. "In this climate, where LGBT rights are facing challenges, centers offer a place for LGBT people to connect and organize." The report is a joint effort by CenterLink, an organization that supports LGBTQ centers across the country, and MAP. The survey data include 128 centers that opted to participate, out of 219 identified. They’re located in 40 states, D.C. and Puerto Rico. Many centers face tough financial realities. The study found 45 percent of centers have annual budgets under $150,000. Most rely heavily on volunteers: 25 percent have no paid staff, and 32 percent have less than five paid staff members. Ten percent have no physical space, and just 27 percent own their own space. Despite this, the services centers provide are broad. Two-thirds offer direct physical or mental health services, such as counseling, peer-led programs, and prevention and testing services for HIV and other sexually transmitted infections. A majority also provide counseling for domestic violence as well as a suicide hotline. Job training services are also key to serving the community. Two-thirds report that more than half of the people who access their programs earn less than $30,000 a year. Almost 75 percent of centers offer computer access and many offer job training programs. Goldberg also noted that centers are serving a role in public policy fights, with 93 percent active in efforts to educate the public and effect policy. The work of changing public opinion is particularly challenging in rural areas, where centers with steep obstacles often have few resources. OutCenter in Benton Harbor, Michigan, has just one full-time staff member: Mary Jo Schnell, its executive director. The center serves an area of about 40,000 people that is 81 percent rural in the southwest part of the state, a two-hour drive from Chicago. Schnell moved to Benton Harber for the job in 2015 from Chicago, after working as a consultant since 2012. She said social attitudes toward LGBTQ people in the area “are like going back 20 years, especially since the 2016 election." "It’s night and day from Chicago," she added. The center had $177,000 in income in 2017, which includes the dollar value of services professionals offer the organization for free, almost $29,000 according to Schnell. The center offers groups for mothers of LGBTQ kids, after-school drop in hours, “the pastor is in” sessions with religious leaders, and a support group that addresses various issues, including employment. To affect broader social change, however, the center focuses on educational programs that have broader reach and can affect systemic change. OutCenter recently led an inclusion training at Lakeland Health, a large employer in the area. Schnell said soon after, a teenage girl called and said after her mother attended the training, she was now allowed to attend programming at the center. 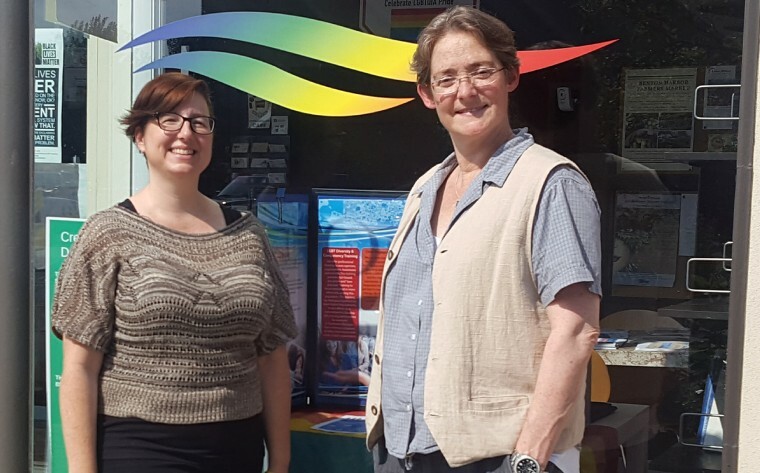 The LGBTQ community center report spotlighted OutCenter for its work on creating change for LGBTQ youth. The center's “Teen Pride” program serves as a gay-straight alliance. Schnell said that when they started it there was only one alliance in the area. Now, more have popped up as teens experience the “Teen Pride” program and lobby for alliances in their own schools.